I read this article and found it very interesting, thought it might be something for you. 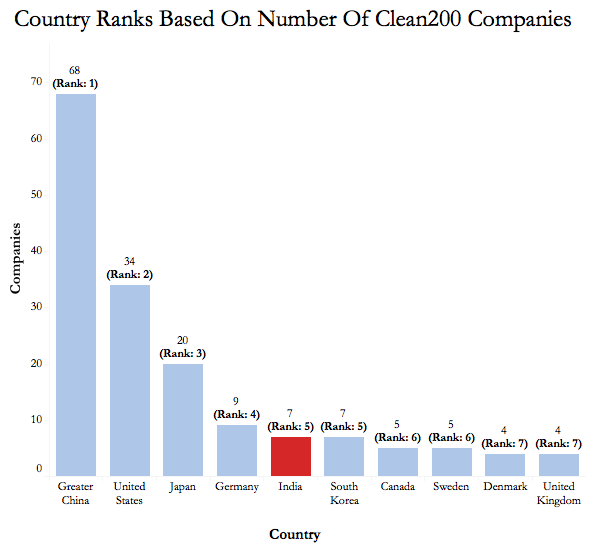 The article is called 7 Indian Companies In Global #Clean200 List and is located at https://archive.indiaspend.com/viznomics/7-indian-companies-in-global-clean200-list-59348. Seven Indian companies – Suzlon Energy, Bharat Heavy Electricals, Tata Chemicals, Exide Industries, IDFC, Thermax and Havells India – were included in the August 2017 Clean200 report, which ranks the largest publicly listed companies worldwide by their clean energy revenue, as rated by Bloomberg New Energy Finance (BNEF). The list has companies from over 30 countries that generate over $353 billion in clean energy revenue per year. India was ranked fifth, with seven companies, while China topped the list with 68, followed by the US (34) and Japan (20). Note: In order to be eligible, a company must have a market capitalisation (the value of a company that is traded on the stock market, calculated by multiplying the total number of shares by the present share price) greater than $1 billion (at the end of Q32017) and earn more than 10% of total revenue from new energy sources like renewable energy, energy smart technologies, carbon capture and storage (CCS), and carbon markets.